Above: Self edge rolled cove countertop showing adjacent coved splashes without the need for mitered seams at the inside corner. Above: Bevel edge rolled cove countertop. Bevels, borders, wood and other applied edges provide interesting alternatives to the standard self edge. Above: The development of postforming grade laminate allowed for "softer" edges which proved more comfortable to work at. 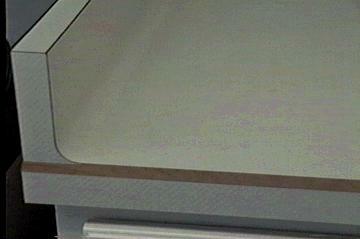 Above: Solid Surface receptionists desk showing thermoformed corners, and rigid seamed deck and edge inlays. Started in 1958, C. Mather Co. soon earned a reputation for innovation and quality. In the early days of linoleum countertops, Clayton "Chuck" Mather, like other countertop fabricators, would heat and "cove" the linoleum from the countertop deck up the wall. 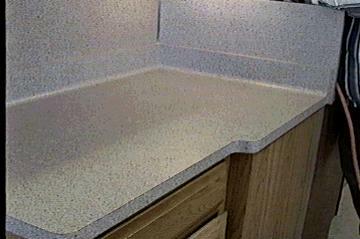 When plastic laminates became the preferred surfacing material, he developed fabrication techniques to create a similar effect and the custom cove rolled countertop became an early Mather trademark. Most countertops of this time were rigid glued in panel sized slabs and cut to shape as needed. The front edge was usually a metal band, called a "snap-on edge" which was applied after the deck had been cut to size. 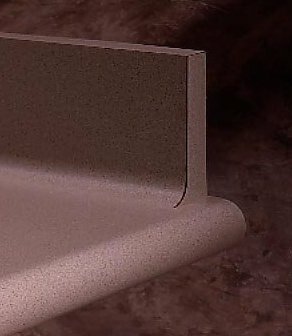 Upon the refinement of contact cement for countertops, fabricators could apply the laminate itself to the front edge of the countertop. This became known as the "self edge" front. As laminate manufacturers developed better grades of bending material, called "Postforming Grade" laminate, both the custom houses, like Mather's, and the production houses begin rounding over the front edge of the countertops. Mather continued to develop edge shapes and styles from bordered inlays and applied edges, to special wraps and postformed curves. 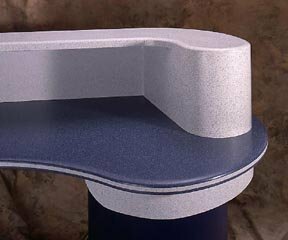 In the mid sixties, Chuck Mather was shown a prototype of a product that would develop into the solid surface product we know as Corian®. 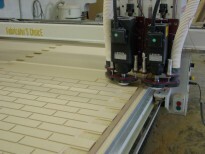 Mather was the first in the state to work with the material and, with typical Mather attitude, started developing new methods for fabrication and adhesion to create countertops that the manufacturers of the materials could only dream of. 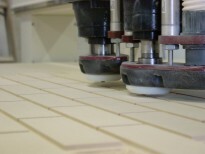 Staying ahead of the technology curve, C. Mather Co., Inc. (Mather Countertop Systems) was one of the first countertop fabricators in the area to make use of computer numerically controlled technology (CNC). This made it easier for us to do the old-school work, and keep it affordable in the modern era. The growth and diversity of the countertop industry is due to a cooperation between the manufacturers and fabricators. Mather has been working with the technical teams of all the major laminate and solid surface companies almost from the beginning. We are in the second generation of Mather's, and we are hoping to add you to the substantial list of satisfied customers.